Ty, Inc. Ivy, No. 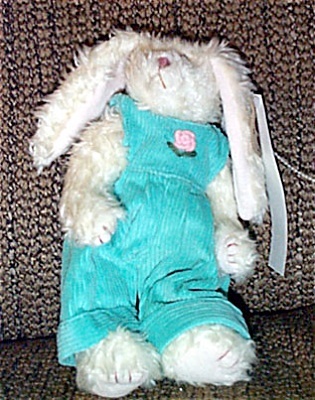 6076 is a small standing jointed white bunny rabbit Attic Plush who is wearing aqua overalls with a rose on the bodice. Ivy is 10 inches tall including ears and is from 1998. Ivy was introduced on January 1, 1998 and retired on December 31, 1998. The bunny's verse is 'Happy Spring.' This retired bunny rabbit is new, and mint, with tag. Has not been exposed to unpleasant odors.